Max's Musings - Going Green: Is Your Project a Part of the Great Con Game? Going Green: Is Your Project a Part of the Great Con Game? A recent research article caught our attention. Apparently, new research shows that chemicals on ants' feet tranquilize and subdue colonies of aphids,, keeping them close by as a source of food. 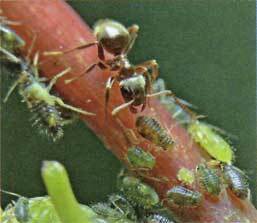 The study throws new light on the complex relationship between ants and the colonies of aphids whose 'honeydew' secretions the ants eat. Postgraduate researcher Tom Oliver observed: "We believe that ants could use the tranquilizing chemicals in their footprints to maintain a populous 'farm' of aphids close to their colony, providing honeydew on tap". See Figure 1. Under the guise of technology transfer, this fabulous concept could be adopted by PMOs everywhere to maintain a "populous farm" of "human resources" to be devoured by projects whenever needed. Press Release: In future, all project managers are required to perambulate with bare feet. And speaking of green, "green" is the latest buzzword implying "sustainability"; "sustainable development"; protection of the environment; an attack on greenhouse gases - specifically carbon dioxide - and, ultimately redirection of the planet's current trend towards "global warming". A delicate shade of green is a nice sort of color. It occurs naturally in most plant life, arising from the chlorophyll through which all ordinary assimilation of plant food takes place. So, while aphids may not be familiar to all of us, green certainly is. Green is calming and comforting. It comes as no surprise then, that everyone is now urged to make his or her projects "green". Certainly, we should all do our best to conserve energy and materials - perhaps drive less (reduce consumption of fossil fuels), walk more (good for our health and providing time to think) - and reduce waste. But isn't that what we should always be doing in the interests of project efficiency and economy? And, in the final analysis, do you really think that these disparate efforts will have any significant impact on the planet's current cycle of global warming? We think not. In the meantime, "green" has captured the general public's imagination and everyone wants to climb on the bandwagon. Commercial ventures everywhere are trying to impress us with their "greenness". We are urged to buy products labeled "green", especially if they are more expensive and more profitable, and we are urged to buy new more fuel-efficient cars. (Of course, someone else can use the old ones.) True, large Canadian companies like Loblaws, Home Depot and Canadian Tire are doing things like eliminating plastic shopping bags, introducing efficiencies in shipping operations, automatically turning off store lighting, recycling auto parts and so on. But how about office tower owners turning off all those lights at night, and municipalities generally reducing lighting levels, all of which make cities visible even from outer space? Wouldn't that make a bigger dent in our energy consumption? For its share, "Big Industry" is being urged to reduce its carbon emissions, certainly a good idea if it leads to greater efficiency. But make no mistake; the cost will be passed on to the consumer. Any time now, there will be a real concern over inflation. The cost of energy underlies almost all of our economic activity and the price of fossil fuels, our source of the majority of the energy we consume, has escalated remarkably in recent months. To the extent that such price increases encourage more frugal use of these carbon-based energy sources, even if only temporarily until we get used to the idea, this should be seen as a great help to the environment. But somehow, environmentalists are mute on this issue. Meantime, the engineering, construction and building industries are constructing as hard as they can go. Building bigger, better, higher and larger, massive infrastructure projects to service more people and to get people to where they want to go. All at a cost of consuming more land, materials, and generating waste. Is all of that really environmentally responsible? Is it really green? Somehow it doesn't seem to make sense. Rather, it seems like we are running around in chaotic circles, trying to kid ourselves that we are being "responsible", all the time making matters worse. Take this example. To encourage the reduction of carbon consumption, there is a device known as "carbon offsetting". A carbon offset is a financial instrument representing a reduction in greenhouse gas emissions. Governments "buy" carbon offsets in order to comply with caps on the total amount of carbon dioxide they are allowed to emit. Offsets are typically generated from emissions-reducing projects. The most common project type is renewable energy, such as wind farms, biomass energy, or hydroelectric dams. Other common project types include energy efficiency projects, the destruction of industrial pollutants or agricultural byproducts, destruction of landfill methane, and forestry projects. Carbon offsetting as part of a "carbon neutral" lifestyle has gained some appeal and momentum mainly among consumers in western countries who have become aware and concerned about the potentially negative environmental effects of energy-intensive lifestyles and economies. Organizations that have difficulty meeting their emissions quota are able to compensate by buying "Clean Development Mechanism" (CDM) offsets. CDM is a brilliant social engineering scheme to encourage industrialized countries to invest in projects that reduce emissions in developing countries. However, to prove that the project will result in real, permanent, verifiable reductions in Greenhouse Gases, proof must be provided in the form of a project design document and activity reports validated by an approved third party. Back to our classic case: In 2006, the UK government established a project designed to offset the greenhouse gas emissions resulting from the previous year's G8 Summit in Gleneagles. For the sum of £50,000, emissions cuts were to be made at a housing project in Cape Town, South Africa, by replacing conventional light bulbs with energy saving ones, and old stoves with new efficient models. In this way, the sum of the original emissions arising from both the summit and the South African households would be halved and each cut of one tonne of carbon dioxide (or equivalent greenhouse gas) would create one unit of carbon credit. Unfortunately, the charge by the auditors for checking that the project was being carried out as agreed, in the end exceeded all other costs, leaving the local South African authority to borrow money to pay for the energy saving devices themselves. The real project lesson here, of course, is for governments to show leadership by cutting back on those G8 summits - but don't expect that to happen any time soon. The marvel is that no one, least of all G8 Summits and similar grandstanding assemblies, ever talk about the biggest problem, and hence the biggest potential project of all time. This would be a worldwide project to contain the presently unsustainable path of growth. The objective of such a project would be to devise an economic system that lauds stability rather than growth as the perfect mantra. In the absence of such an initiative, like long periods of sustained bull markets, a correction can be expected sooner or later. And the longer we leave it, the more cataclysmic that correction will be. Aphids of the world watch out! 2. For those who live in the concrete jungles of big cities and have somehow become divorced from the natural environment, aphids are little green insects about two millimeters long that delight in devouring rose buds before they have a chance to open, along with other similar garden delights. 4. Read: "Project Team Members"
5. Greenhouse gas emissions apparently cause heat to be trapped in the atmosphere causing it to heat up and that, in turn, exacerbates climate change and "global warming". Hence, it may be said that it is a contributor and not necessarily the cause. 8. Read: "dispense taxpayers' money on"
9. According to levels set by unelected Kyoto Protocol "experts".